Dom Francisco situated just 500 mtrs away from the beautiful Candolim beach with it's silvery sands. Dom Francisco offers you mouth watering culinary preparations at it's exclusive restaurant serving authentic Indian food. Its outdoor bar offers a variety of drinks , galore! It's casual homely environment makes it the ideal place to enjoy your holiday! Besides this, you could also treat yourself to the multi cuisine preparations at 'Palmgrove' restaurant serving authentic Goan food, Barbeque and Tandoori delights. A pool side bar with thatched roof overlooks the pool. A variety of cultural programmes like folk dances, theme evenings, and barbeque form part of the entertainment, besides a live band in attendance. Dining at Dom Francisco Resort, Goa is a delightful experience. The resort features an on-site exclusive restaurant that serves excellent quality authentic Indian delicacies. At the multi-cuisine "Palmgrove" restaurant, you can treat yourself to lip smacking delicacies that include spicy Goan food, barbeque and Tandoori delights. Dom Francisco Resort, Goa also boasts of an outdoor bar where one can sample exotic cocktails. The resort also features a well stocked poolside bar. 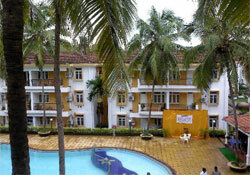 Dom Francisco Resort, Goa is designed to appease the corporate guests as well. The resort takes pride in its air-conditioned Conference hall that serves as the ideal venue for organizing business meets and conferences. Among the recreational facilities and services that the guests can avail at Dom Francisco Resort, Goa are included the swimming pool, cultural programmes like folk dances and theme evenings, barbeques and live musical performance by a band.